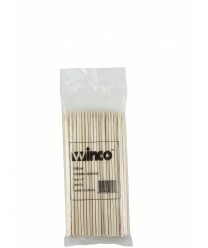 Durable, easy-to-load and made of all-natural renewable material, the Winco WSK-06 Bamboo Skewers, 6", (100/Bag) are a real crowd pleaser. These bamboo skewers are perfect for making vegetable, meat or fruit kabobs, and they are designed for one-time use, so clean-up is quick and easy. The 6" bamboo kabob skewers are lightweight but strong, so they resist splintering, splitting and breakage. The pointed end of these skewers is quite sharp, so piercing dense chunks of food is easy.